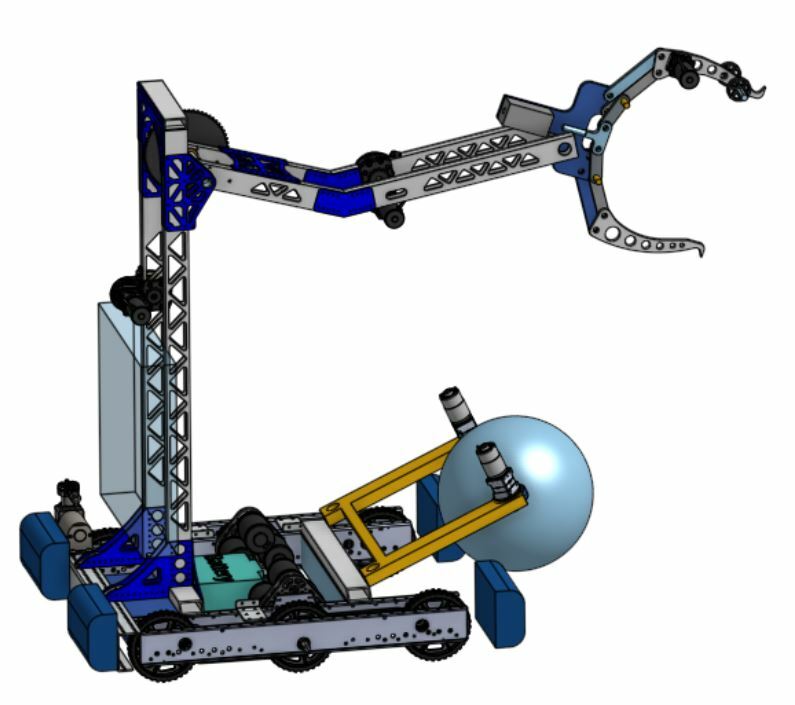 Team 319, Big Bad Bob, is proud to release our public Onshape CAD model for the 2019 season. 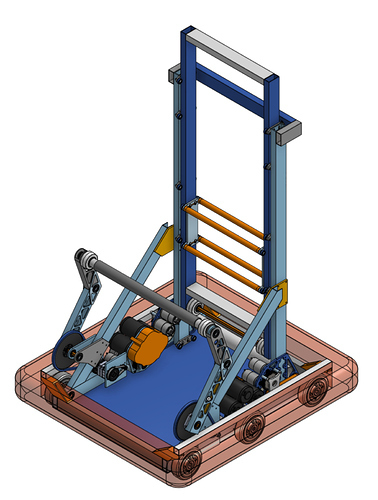 Just like last year, we’re developing our CAD in a 100% open format using Onshape this year. This is a living and breathing CAD file, so you’ll see it change daily, maybe even hourly. The model is free to copy and borrow ideas from, we simply as that you let us know if you found it helpful. If you have any questions or suggestions, please ask below. We’re hoping to learn as much as we can. Our plan is to have a level 1 hatch mechanism on the back and a level 1-3 hatch + cargo mechanism on the front. A cargo collector will hand off the cargo to the mechanism on the elevator. To climb to level 3, the elevator will drive down below the robot and the collector will lift the front. Also like last year, we’re still working on the thing that’ll score the things. I just didn’t have time to CAD up a bench grinder. What do you use to control lateral load on your elevator? I tried looking at the CAD but it is frustratingly difficult on a phone to figure out. That’ll be part of the hatchback mechanism. Your elevator bearing blocks are awesome. I love how compact and simple the are. Have you had any problems with them realigning once extended past the block placement? Looks great so far! Thanks for documenting your design progress. I know it’ll help a lot of teams (us included). We came up with a very similar climb idea, though ours now seems bulky in comparison haha. Are you planning on powering the Colsons at the bottom of your first stage? If you don’t mind me asking, how is the elevator going to be powered? Seems like continuous would be challenging because the carriage can’t power the middle stage lower than the drum (I assume the large round cylinder at the base of the elevator is a drum). Cascading could work, but the mounting point to the middle stage would have to be at least part way up, which would limit your max top travel, and the carriage would have to start not on the base. Maybe I’m missing something important, like a latch or pneumatic? You’re technically not missing it because it’s not there yet. The plan is continuous and to drive the carriage to the top of the first stage, latch in, and then pull down. Have you guys experienced any slow regeneration times with onshape? In some of our major part studios we are seeing regen times of >30s regardless of internet speed. Any tips on making your robot cad run smoother? Having a more powerful computer with a good graphics card will have the biggest impact. Next make sure you’re enabling hardware graphics acceleration in your browser. If you have integrated graphics alongside your dedicated graphics card, make sure you’re instructing your computer to use your dedicated card while using onshape. We try to make one part studio per subsystem, and we try to model the parts approximately where they’d be in each assembly. We rethought the way we did mates after doing the onshape mate tutorials. I try to use the less restrictive mates if I can (cylindrical instead of a revolute with an offset, etc). In addition to @Ty_Tremblay 's suggestions we use Team 1836’s amazing library of parts in onshape. Specifically with regards to electronics. @marcusbernstein and his crew have put together a great resource library that includes some “Simple Electronics” which might reduce the load time associated with trying to load a roborio and all of the tiny parts inside. Interesting, out main problem seems to be feature regeneration times, I think it’s because we put a .201 hole pattern throughout our bot, it takes around 30 seconds to edit an old feature in these major part studios even on our powerful workstations. You can take a look at what is taking the longest by clicking the stopwatch in the upper corner of the feature tree. There’s definitely a limit to how complicated you want any individual part studio to be. looks like one of our lightening features is taking 7 seconds… oof. 30 seconds total time. Suppressing things gets it down to around 10 seconds. We will definitely be subdividing even more in the future. OnShape is an incredible tool. We’ve used it in past years to get concepts on paper before hand-cobbling parts. But this year, after acquiring a CNC router we committed to full design in OnShape. It’s been a complete transformation for us. The parts library made public by MKCAD is a real gift to the community. Onshape + MKCAD = Superfast CAD robots. Similar to Big Bad Bob, our robot is public and we’re changing it daily. We put a lot of effort into making mates that function in ways they should so you can move our arm and wrist and first-cut ground intake. Using revolute and slider mates in Onshape is a great method for testing your geometry against the game constraints. Be careful with overusing motion mates. Our Rev2 end-effector works on a separate tab, but when imported to the main robot as a fully working gripper, it was just too many degrees of freedom and the whole robot turned into a flimsy noodle. So instead, the gripper is modeled fully closed or fully open on the main robot page. You may also see spare parts laying around the robot as we throw ideas at it. The MARtian: Prepare For Launch Into Deep Space! Looking fly so far! I’m loving the pass through for the cargo ball! I noticed you guys were using Oilite sleeve bearings for your hatch panel grabber. We had initially tried something similar, but our 1/2" round tube stock didn’t slide in the bearing well at all – we got a ton of binding to the point where we couldn’t use it. How did you guys make it work? I’m not affiliated with team 319, but we also use Oillite sleeve bearings with 1/2" round stock and we typically ream them out ( I think to .501 ) after they’re pressed into wherever they’re going. We either turn down the shaft stock or drill/ream/bore the bushings. The 1/2" round tube axle from vexpro has a nice outside tolerance and fits nicely.